I was interviewed on the Tajik news twice this week. Which really, when you think about it, is probably the most anyone could ever hope for out of life. The first time was much more exciting (and infinitely more awkward), so lets start there. On Tuesday one of my professors took me to the Nowruz party at the National University. Yes, it was a little late: Nowruz was last week, but because of all the snow, their party got delayed. 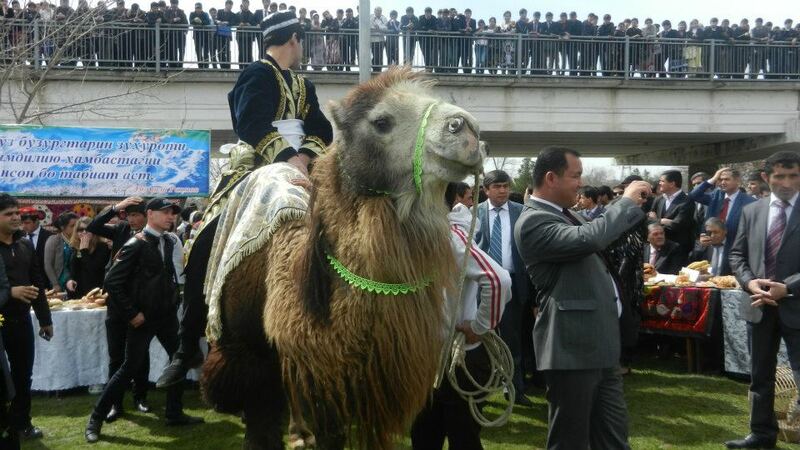 I was one of very few foreigners at the event, which featured everything from a camel to young men dressed as Achaemenid (ancient Persian) Kings to a rooster fight. Thousands of students gathered on the hills around the performance green, and were roughly divided by their academic departments. I sat with the Asian Languages students, most of whom were studying either Farsi or Hindi. I miss some things about home. But the lack of camels there is pretty disappointing. I was perfectly happy to relax on the grass and make friends, but hospitality intervened. Another professor insisted that her top student accompany me on a tour of the Nowruz party. This mostly involved stopping at every department and snapping pictures with the exhibition they had created. 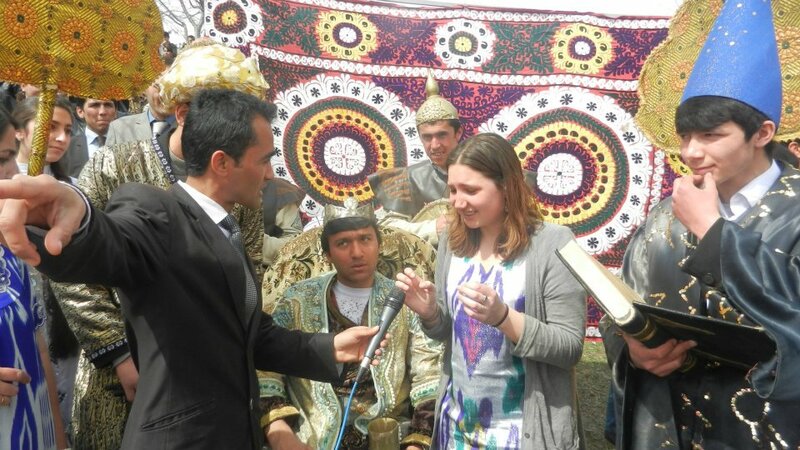 Along the way I met a reporter, who was amused by my traditional Tajik dress and ability to say things in Persian. He insisted that I wish all of Tajikistan and the world a Happy International Nowruz Day. 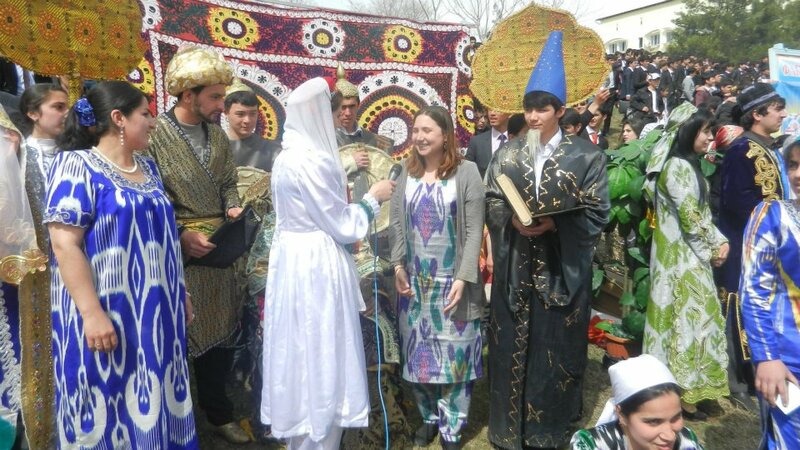 In case you don’t watch Tajik state TV, Happy International Nowruz Day. Two different people interviewed me, actually. I don't really recall why. After that excitement, I wasn’t expecting ANOTHER chance to be on the Tajik news to pop up that very week. But waddayaknow?! Friday, Joey and I were walking down the street after teaching our English class. And the Tajik News was producing a segment where they ask people on the street random questions. They asked us what we did when we had a fever and wanted to feel better. It was a little confusing. But, good little foreigner that I am, I answered. I said I sleep a lot. The other exciting news is that it is spring. Winter in Tajikistan is hard. Just freaking difficult. Spring, on the other hand, is lovely. I stayed out past 10pm for the first time in weeks. There are outdoor bars and cafes cropping up throughout the city again. The smell of fresh grilled shashlik (kabob) fills the streets. People walk around outside. I only have to wear one pair of pants, instead of three. My feet aren’t constantly wet from stepping in melting snow. Children don’t pelt snowballs at my silly foreign self. We’ve had electricity all week. In class, I sit on a chair, instead of on top of a space heater. Its really wonderful. 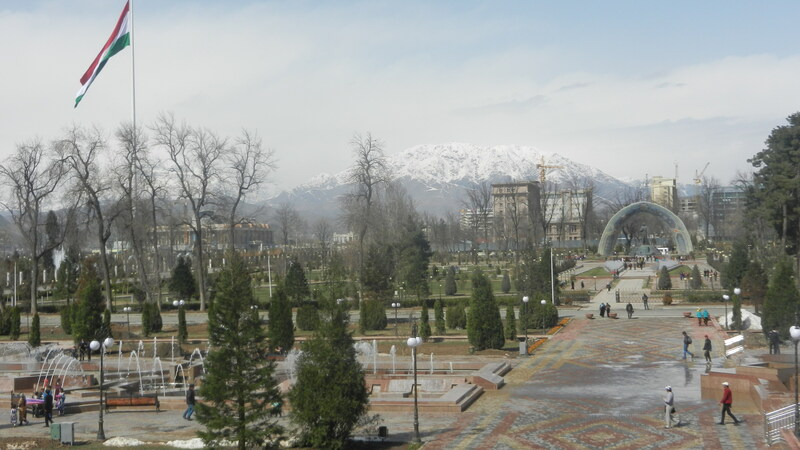 Springtime in Dushanbe! View from the new National Library. On Saturday, we took advantage on the nice weather by hitting up a bazaar and marveling over the fruits. I’ve been thinking lately that I couldn’t live anywhere without a good bazaar. Not a wimpy farmer’s market. A proper bazaar, where giant slabs of concerning meat hang next to the freshest fruit, and people yell at you from every corner. Someone has to sell ready-to-eat corn for less than 25 cents. There should probably be some stray cats. After buying some nuts, and also investing in some spices, we trekked up to the World War II Monument. Really pleasant place, on top of a hill, with a great view of Dushanbe. Pretty mountains, rustic houses, smoke stacks emitting black ash. But this glory was never witnessed. only then was it known. 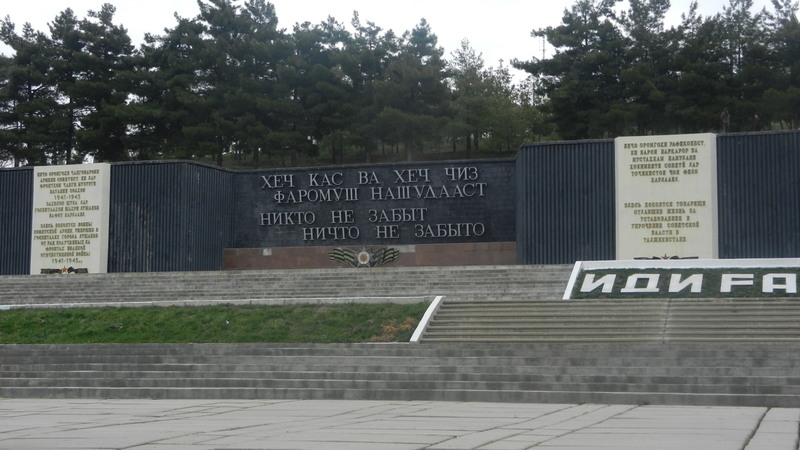 This entry was posted in Uncategorized and tagged awkward, Bazaar, dushanbe, Farsi, foreign, Nowruz, Persian, Spring, Tajik News, Tajiki, Tajikistan, World War II Monument. There are stray cats in our neighborhood in Erie! You are all set!